Wish you a Very Happy New Year. Terrorism – There is a new common for the world – terrorism – so that was as usual, religious extremism has not only kept its target India but added Europe to it. These apparently look like some unorganized terrorist attacks, but the end of many of these thread is common. The list is not small – https://en.wikipedia.org/wiki/List_of_terrorist_incidents,_2016 We need to ask ourselves – when are we going to be “human” behave like humans? Did we learn anything from this in 2016? In fact I wrote this and heard 2017 has started with terrorist attack in Turkey! Waste! These good for nothing parasites on the face of earth do not understand what nonsense they are involved in, if some religion teaches this that is not a religion at all. Business & Economics – There were few big developments in the year, first UK voted to leave European Union, second Wells Fargo of US was found out to be involved in a big scandal and third India demonetized high denomination currencies. Here is a wonderful Ted Talk on UK’s vote to leave EU. What banks did post demonetization in India must be a subject matter of scrutiny same as Wells Forgo in the US. Another battle happening currently in India is Tata group Vs Cyrus Mistry (the story is yet to unfold fully in 2017). As of 10th Dec 2016 (source), Investors of Tata group have lost about Rs 81,000 crore (810 Billion INR) in seven top Tata group companies since October 24 as Mistry was replaced by Ratan Tata as Tata Sons chairman. Politics – Donald J Trump the next President of USA. It was most surprising and unthinkable when campaigning started last year. I wonder if what inspired Trump was mockery by Obama in white house in 2011. Corruption – There was enough and more hue and cry about Panama papers. Corruption of many rich people worldwide. What is Panama papers? Watch the following video to know more. We must ask each one of these filthy rich people – what would they get by making, hoarding and rolling so much money all over the world? Remember we all leave everything here, including the wealth. Will 22K people turn up to catch Pokémon in San Francisco and what less – Robbers target Pokémon Go players in Missouri. What all these events have taught us? Humanity is important than a religion and terrorism. Globalization needs a perspective of interdependence at times we need to let go of some control, at times be need to think of inclusion. Every company has to be responsible, whether its Wells Fargo or Tata group. Never mock anyone, even if you are the president of the worlds most powerful, economically strong country. You will leave your wealth here only, pay your taxes instead of evading it. Legitimate money will make you and your money more respectable and in the end you would leave your body too here, wont take anything back with you. If you are doing something, put your heart and soul in it, make it awesome like the Pokemon Go! This was LBC topic for farewell to 2016, I am late, was bit occupied with a preparation for a workshop on IPR held yesterday 31st Dec. You can read other blogs of other Loose Bloggers Consortium members at Ramana Uncleji and Shackman. I was watching Gulal (A Hindi Movies by Anurag Kashyap) yesterday, somehow, it is available on Youtube. That movie revolves around State of Rajasthan, kings of that state and their wish to get independent Rajasthan – independent from India. At first it sounds very weird, as the story unfolds different characters start playing their strategies for their own benefits. Whatever happens in the movie, that movie reminded me of Brexit – British Exit from the European Union. After watching the movie, I was going through the documents of European Union. EU came into existence after two consecutive world wars. The wars which involved almost the whole world but centered around Europe. Just imagine a Europe between 1920 to 1938 (between the two world wars, or the Europe just after 1945. There was enmity, conflicts and the fight for economic dominance. This all actually ended with economic agreement! Isn’t it interesting? The foundation of EU was more on economic development, social development – let me call it human development. Quote from EU website – “The EU regional policy starts to transfer huge sums of money to create jobs and infrastructure in poorer areas.” Such a wonderful concept that people can cross man-made borders, do business without trouble and follow one set of rules yet their countries do not lose their identity. Just imagine all European countries making a team to compete in Olympics or Fifa world cup! The EU regional policy starts to transfer huge sums of money to create jobs and infrastructure in poorer areas. The union started 21st century with a couple of aims – Peace in member states, Citizen’s security, economic and social solidarity. Such lofty goals require enormous efforts. These efforts at times become lobbying for one or the other. No doubt there may have been political and business interest groups who might be trying to get better deals or benefits for themselves. This type of lobbying – or cheating in some ways – can only be stopped when there is genuine connect to develop others and heartfelt desire to help those in need. EU adds close to 20% to the world GDP, what is more important to note is – its population is only is only 7% of the world population. Just imagine if we get to see such geographic unions in other parts of the world, such as South East Asian Union or South American Union. These type of geopolitical, economical and social unions would require building trust first. A caution the union must only be on two fronts – economic development and social welfare. No! don’t even think of religion – religion is and must be an individual pursuit, those who make religion a group’s belief they mostly want to gain power. Also, religion is only used mostly for generating fear in the heart and mind of followers. The movie Gulal had a very selfish and political motive. Can we compare that story of Gulal with British Exit from European Union? At times my mind says yes and other times no. No because it was a democratic decision, based on votes from common people. The statistics says older people were not in favor of remaining in EU. Reason – they were getting affected in many respect on personal level. By the way, these old people are the same who had benefited some or the other ways from being a part of EU. My mind says yes because who says canvassing was not done? Who says there was no political motives, selfish goals? Who can deny all these? It has repeatedly proved that we select being individually smart and therefore we are collectively dumb – British exit from EU is an example of the same. Though we may argue that parts of Britain was against it and 51 to 49 cannot be generalized. Also heard that those who voted against were fearful of immigrants. I wonder how big is the problem of immigrants in Britain! Of late, the fear of immigrant is evident in a way – every morning I am waking up to a city trending on twitter. There is some or the other attack at some place, European Union was built for peace and social uplifting – not for terrorist attacks. My question came a full circle from the movie Gulal to British Exit to Gulal again – What drives people? What drives an individual? Ambition, selfishness or fear? I wish in future we would not be driven fear and selfishness and, in future we would see such union and countries coming together to prosper together, instead of people terrorizing and killing fellow human beings. This wish includes economic and social development – religion is a very personal affair, it should not come on streets and should not be forced. Disclaimer – Author supports such collaboration and unification as done by the European Union. Such unions would one day make our world more connected and the interdependence will help us embrace each other with our respect, trust and support to each other as fellow human being rather than black or white, European or Asian or for that matter capitalist or socialist. We indeed are interdependent. Terrorism – Silent Majority doesn’t count – Solution please! If you are unwell, you cannot think of anything better, do anything better. So it become very important to get well first. If we as a humanity needs to grow, we cannot talk about spirituality in isolation. We have to find a solution to the problem of terrorism. A hungry man should not be taught religion – he needs food, a sick person needs a doctor / medicine. I think, In my previous blog the premise was completely incorrect. Fanatic followers of anything do not listen to the argument of others. I was trying to find a solution of Islamic world through the Buddhist teaching. However naive that attempt was, it was a genuine and earnest attempt. Somewhere fundamentalist and even other moderates need to learn from the Buddha. I have been thinking about solutions with reference to terrorism. A small guy, sitting in one corner of world wonder how many and who would listen though – yet thinking about a solution! We cannot talk about business, economics, human development or spirituality if we are facing a threat to life on a daily basis. So a solution to terrorism is of paramount importance. For argument sake – lets assume whole world becomes Muslim. The next question will be – which Muslim? Shia or Sunni or Ahmedi? There are 70+ different division of followers of Islam. So don’t you think the next fight would be who is a “True Follower”? Well, the stream of questions would be endless. Recently someone sent me a video on whatsapp, it was worth a thought. I can’t corroborate the statistics so I am not commenting on the same. Question is excellent and so is the answer worth introspection. The point in this video is – Silent majority does not count. So whoever it is (currently the whole Muslim community) needs to think. The Buddha taught to “question and experiment with everything, once you are convinced accept it otherwise do not”. When I read about the Buddha’s life story I read – he told his followers to even refute and go away if they are not convinced. Here Richard Dawkins says the same (the following video was a suggested video when I searched for above video). I am impressed with the point of view of Mr Dawkins (55 sec onwards). I know people – specially Muslims friends – will question about what is happening in Myanmar. Muslims are being killed there so is it what the Buddha taught? Well the Buddha did not teach that and Buddhism has no history of violence, lets ask about other religions, does any other religion – except Jainism – has similar roots of non-violence? Certainly Islam spread through violence – Indian history is full of that. If you’re a silent majority – in this particular case of Terrorism and Islam – you do not count! Raise your voice and teach your fellow followers what is wrong with them. The whole humanity is at risk who knows these random acts of terrorism will convert into full blown world war and every person will have to take side? Last word – Raise your voice. 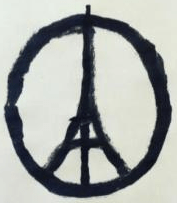 Paris attacks – Solution please! Everyone agrees, there is a problem of terrorism (suffering). What I think is – The Buddha will approach the problem of terrorism by analyzing it – what is the cause of this suffering. No doubt if there is suffering we can safely assuming there could be an end to it. In this case I believe the Buddha would try to analyze the problem and suggest a solution (as he suggested eight fold path). So, I tried searching for possible reasons for Syria issue (I am not touching the terrorist activities of Taliban and Pakistan sponsored terrorist activities for this blog). There were various impacts I tried analyzing such as – why ISIS came into existence? A first level answer to it was Iraq war. Is it really an issue of 2003 Iraq war? Then I read this – You Can’t Understand ISIS If You Don’t Know the History of Wahhabism in Saudi Arabia so I started questioning on the very purpose of existence of ISIS? I started creating analogy of creation of Taliban (by USA) to fight former USSR and ISIS as one sub-section of Saudi Arabia. I may be completely wrong in the analogy however who gains if the ideology of ISIS gains more ground worldwide? Is it a problem of religious supremacy or political and power struggle? Perhaps it is both – I could not conclude on that with fair bit of confidence. I left the question aside for some time. The other side I heard of Syria crisis is power struggle of Shia and Sunni faith of Islam which is contesting of supremacy. Sunni Muslims of Saudi Vs Shia Muslims of Iran are fueling the fight in a third country Syria. So, it is getting more garbled within the religion itself. I moved to analyze the other thing – what is the impact of refugees fleeing to Europe? Does Europe need to show that much mercy to the fighting clans? Is Europe responsible for the mess and therefore it is moral responsibility of Europe to provide shelter to the refugees? Or it is economical requirement of Europe to have working hands for its economy? If these 500,000+ refugees are coming to Europe would it impact the religious balance of Europe? I think the growth rate of European Muslim population is already alarming. So, what is the impact? If the impact of this is intolerance and terrorist attack by fanatics, Europe may close the doors to refugees who knows? Many refugees are coming to save their lives and other for improved standard of living. The – currently unknown – leaders sitting in their offices / mansions are letting people die (whether a Christian, Jew, Hindu, Sikh or a Muslim) to have a last laugh. All these are “craving” in the opinion of the Buddha. Method for working on these craving can be same (eight fold path) however for each type of craving the approach may differ. The question is – would the leaders, refugees and the terrorists follow the path of the Buddha? Related Terrorist meets The Buddha. God is your captain, sail, my Ark! Love is your compass, ply, my Ark! Faith is your anchor, ride, my Ark! Today I was wondering about what if the world is an organization and the God is the CEO! What would be the situation, in the boardroom and what must be going through His mind? Situation – the countries and continents are a department each. There is a cost center – USA – this department is in debt and there seems to be no way out for it to survive. The likely other cost center is the EU – European Union. Operations and manufacturing unit is China. Parts of Middle-East and India a chaotic department wherein the left hand ‘does not know‘, ‘does not want to know‘ and ‘does not want to support‘ what the right hand is doing. The chaos is such that the department is rather a destruction center, not even a cost center. Only good department seem to be Africa and the South East Asia region. Would the CEO resign? Or He would dismiss few those who are responsible for this. For namesake – Former president of USA George W Bush (he forced the world to a war – to me which was unnecessary – the Iraq war), Gaddafi, many politicians including Indian politicians, leaders of the terrorist organizations (Osama is already dead) and those others who are the culprits. Keep aside the joke of the God being the CEO. Do you think that the situation is really dire – accounts (economy), production and administration everything is in a chaos. If yes, do not you think that it is our responsibility to improve everything round us. Should one take life of the other in the biggest organization – The World? (terrorism). Should one be corrupt in the organization where her/his family will also be at the receiving end? (India). Should one produce products which could be contaminated by Lead (China – some toys), be prone to fail and take life (cars)? Should one be so extravagant that the whole organization is under debt because of that department? (USA). Even if we still continue thinking the God be the CEO, would not the CEO want every employee to do his/her job responsibly, be moderate and ethical? Let us hope that the CEO succeeds in his mission and vision of making the organization profitable with the triple bottom-line and make it an ethical organization. With that hope what we need is ‘responsible we’ – each one of us – and committed employee to make the organization a better place. Note – those who are agnostic, for the time being consider God exists. Or do not read the blog, or shoot your concerns/comments. Even if we do not want to consider God be the CEO, I thought about another philosophy from India – ‘Vasudhaiva Kutumbakam’. It means that the whole world is one single family. Would you kill your brother or sister, would you do something for which you may have to feel sorry in your family?